Me..? Sport..? Not much interested , I’m afraid. That is probably a minority opinion, but then most of my opinions are minority opinions anyway, so I’m hardly going to worry about that , am I? I’m the kind of guy who enjoys Tom Waits’ harder- edged later” hit -that engine -block-hard -with -a-big -stick and-see -what-comes-out”- work even more than his earlier” jazzier” boho leanings, so I’m aware that I have always walked on the road less-travelled. It’s just a little flaw in my make-up that I’ve long-since accepted .As a friend pointed out …”Who ,but you, would have five Incredible String Band albums in his extensive record collection?”…Well …yes…exactly! We’re all made different , aren’t we? Now, I know that a lot of people treat “sport ” as food , drink and even as religion.That’s just a fact of life for them. Their entire mind is taken up with it , even though they might never raise themselves from their sofa, except to get another pack of beers from the fridge.They’ll talk about it and discuss it …read avidly about it and generally feel good about it in the way that I’d feel about music or a great book. So speaking of sport , we come to “Sports Personality Of The Year”. Now I’ll have to confess that many of the names will mean very little to me at all, but I know that they are heroes to many ,so they’ll be guaranteed a great night ,wondering if their personal favourite will top the list.It ‘ll be great entertainment for them .We have our own local heroes , of course and I’ve heard of some of those. The most obvious were televisual snooker players such as the conniption that was “Hurricane” Higgens ,or good old Georgie Best , who was not so much a sportsman but a “public personality”.He rose to public prominence not only because of his sporting prowess , but because of the whole package of charm , looks and self -destruction.He was “interesting”.Our own latest “interesting” character is another quirky People’s Person in the more sober mould of his mentor, boxing champion Barry McGuigan (whom I’ve also actually heard about) . This is a young Belfast man by the unusual name of “The Jackal” or Carl Frampton, if his mother is reading this. He has already won boxing championship titles in two differing weight classes and has an ambition to be the first Irishman to to win titles in three different weights. He’s a champion and has already created a bit of a stir. You’d imagine that having done so well with his undoubted pugilistic talents that he might have been shortlisted for the title “Sports Personality Of The Year”, but no…..; it seems that he has not even appeared on the radar for such an event.Are there so many champions to tussle over the title or is he not sportsmanlike enough to make the shortlist? Or is this simply a case of an Irish sportsman ,who happens to live in Northern Ireland, being quietly forgotten about because……well because he lives “over there” and that lot aren’t really properly part of this deal at all.It has certainly knocked a few noses out of joint.Ian Paisley Junior of the Democratic Unionist Party was heard grizzling about it on the radio just now, but then DUP politicians think that the British people and their government are hanging onto their every word and that Norneverland , Ireland is very important and all that ……until something like this reminds them that maybe ….just possibly ….it might not be the case at all. Meanwhile…back at the ranch as they used to say in the old Western films….It’s a rare clean ,clear bright day after the heavy mizzle of damp foggy air these past days .I’m back out there breathing that air, immersed into the real world of the garden , clearing the tangled, rusted rubbish of dying stems, that were once brilliant yellow- golden blooms but are now so much rustling ruination.It’s all stillness, except for the slight buzz at the front of that most recent hive. it’s late in the season for them to be out at all. Outside this hive these new bees appear to be making the most of those precious ,few vague sunrays.They are gathering to bask in the low ,rare trickling moments of heat. 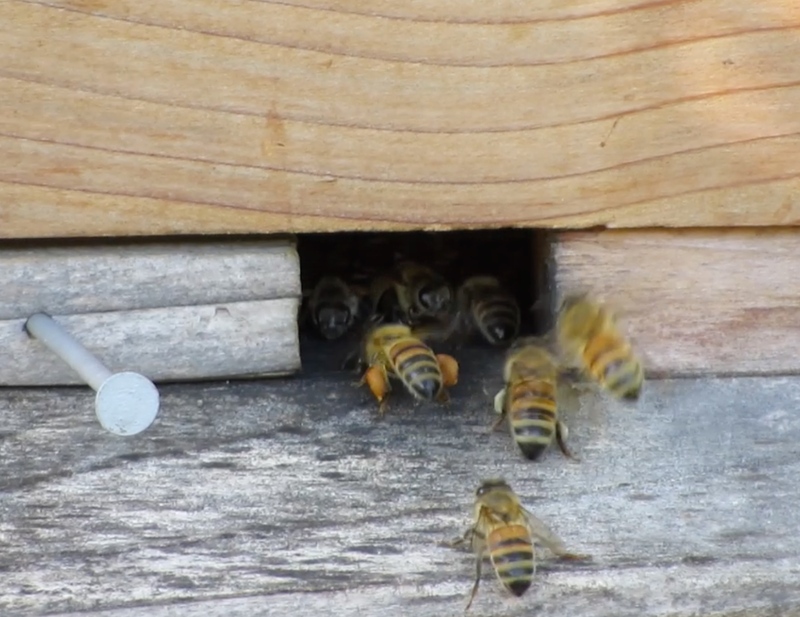 The other hives’ residents do not appear to have noticed at all and are quiet. Perhaps they know that it’s hardly worth the bother to go out because the day will be short and the cold is always lurking like a thief. Maybe ,better to huddle inside instead. I sneaked up behind that new hive and lifted the roof without bothering with the smoker .There was still some sugar syrup in the feeder but that might be because it has soured or that they have had enough already.I decided to leave it for another week before removing it .As a precaution I put in a kilo bag of white sugar .I’d already dipped it into a bucket of water for a moment or two .Hopeful that it will form a nice crunchy crust for the bees to nibble through.You never know with bees ; they could just as easily carry each grain of sugar down through the hive and dump it out one grain at a time , through the front door without bothering to taste it.They do like to keep things tidy …..nearly as fastidious as my wife, really.Better to give them something solid to work at until they realise that it’s food. Winter is here alright and there’s really little to be done but to take an hour or so now and then to keep things tidy. The garden is a bit like the politics in the world beyond , at the moment .There’s really not a lot happening after the festival of life that was summer.In the world beyond ,after the ranting and raving and the brouhaha of Brexit, nobody seems to know what to do next and are afraid to say so . In America it’s much the same .Donald Trump thought it would be a lot of fun to run for President….. it probably was….until he got the job.He’s about to learn what frustration really means.It’s about time himself and Theresa May gave a thought to taking up gardening and keeping honeybees, methinks .Everyone needs a little solace in an increasingly mad world. The only problem is that the road less travelled doesn’t lead anywhere, Harry. As you can see the bulk of us ignorant savages have left you at the fork. What” ignorant savages”, fiosrach? Dear, dear ….that’s a bit inflammatory, surely? You might have a wee touch of the “pommier sauvage” ,fiosrach, but “ignorant”?…hardly …I’m nearly sure…. I’m with Harry on not knowing, and in my case, caring about spoty however, being as herself indoors bet me a few bob last evening, that thon wee gaisun from just down the road from her, Carl Frampton, fights under a Brit, or should I say, a UK passport, I indulged her as I’m sure I heard he actually fights under our own passport, and nationality, might someone please clarify? Maybe some of our armchair genera….er, sportsmen ,…will be able to straighten us all out on the “political” backstoryand the details of Mr Frampton’s travelling arrangements , Mark. I hope so, I’m not a betting man but, if I’m correct, the look on my wee wife’s face will be worth it. 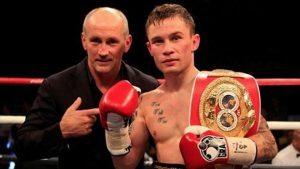 I thought Frampton’s and McGuigan’s tantrum was really quite petty. I’m sure there’s many other sports men/women that would love to have been shortlisted for Sports Personality of the Year but were disappointed to find they weren’t. They took it on the chin and carried on. But not Barry and Carl. They got quite upset. I mean Carl is a great boxer (so was Barry in his time) but would he have even won the prize? I don’t know…. I just thought the whole tantrum cheapened Frampton and McGuigan. It appeared too much like Frampton shouting “Look at me! Look at me! Give me attention!” like a spoilt child, “give me an award because I won a fight. Give me more money while your at it!”. I don’t think I was the only one who cringed and felt a little uncomfortable when both Frampton/McGuigan spoke about their cash on the Nolan TV show earlier this year, even saying when they expect to be paid….. If I was a great fighter like Frampton, I wouldn’t be paying any attention to crackpot prizes like “Sports Personality of the Year” awards. I would be solely focusing on winning fights and getting more belts. But I think some people have been paying way too much attention to the massive successes of Conor McGregor and the financial rewards that brings and want a taste too….getting media attention and winning crackpot prizes can help with that…..
Frampton is but dunno about McGuigan. After all he ducked and avoided the main man at that time, Azumah Nelson. A chancer who knew his limits. You reckon that they were bad “sports” then , Ryan? That would disqualify them right away, alright. The objective of boxing is to cause brain damage to your opponent so it can hardly be called a sport except by “savages”. I am not wholly sure that the actual intent is to cause brain damage as such,deo, although that can sometimes be the end result for sure.